The three Liechtenstein stamps shown above (Sc. #212-14) were issued on April 9, 1945 to celebrate the Birth of Prince Johann Adam Pius on February 14, 1945. The high-denomination 5 Franken definitive stamp shown above (Sc. #217) was issued on September 3, 1945. The stamp is engraved, perforated 11 1/2, and it was issued in sheets of 8 with marginal inscriptions. The design features the arms of the Principality of Liechtenstein superimposed over a view of Vaduz Castle. The three charity stamps shown above (Sc. #B15-17) were issued on November 27, 1945. 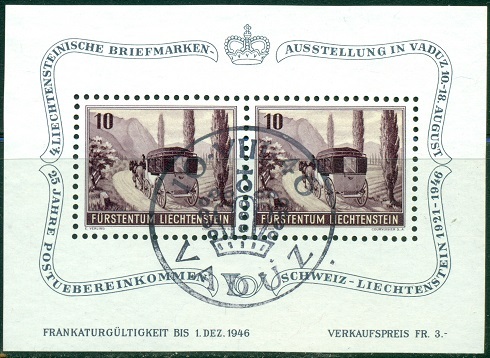 The surtax on these stamps was to benefit the Liechtenstein Red Cross. The designs of the three stamps depict allegories of: "Protecting Children", "Taking Care of the Sick", and "Help for the Aged". The high-denomination 10 Franken definitive stamp shown above (Sc. #218) was issued on March 14, 1946. These stamps were engraved, perforated 11 1/2, and they were issued in sheets of 4, measuring 105 x 130 mm. The design features St. Luzius, the Patron Saint of the Principality of Liechtenstein. (Historical information on this person has been very difficult to locate on the internet, but) ... St. Luzius appears to have been an early Christian missionary to the Roman province of Rhaetia around A.D. 180. According to some sources, he had been a king in England and had converted to Christianity as a boy. He abandoned his crown and his subjects, according to legend, and became a missionary, traveling to Augsburg and then to Chur, converting thousands of pagans along the way. At the age of 80, he was stoned to death by the Romans, as they considered him politically dangerous. His relics are kept in the Cathedral of Chur in Switzerland. England or Angla Land did not exist in A.D. 180 .... it was the Roman province of Britain. I can't imagine Christian missionaries in central Europe in A.D. 180, as the overwhelming population of the Roman Empire and the other civilizations of Europe at the time were not Christians. And, the "Catholic Church" didn't exist until about the 4th Century. If any of my site visitors from Switzerland, Liechtenstein, or elsewhere could provide corroborated information on this particular St. Luzius, I would appreciate it, and I will gladly modify the historical notes above. The souvenir sheet shown above (Sc. #B18) was issued August 10, 1946 on the occasion of the Lichtenstein Philatelic Exhibition in Vaduz. The sheet also commemorates the 25th Anniversary of the Swiss-Lichtenstein Postal Agreement. The souvenir sheet contains two 10 Rappen stamps, each of which depict a classic Mail Coach. These sold for 3 Franken, with the proceeds going to the philatelic exhibition. The three Liechtenstein stamps shown above (Sc. #219-21) were the first of a continuing series of stamps featuring game animals. These three stamps were issued December 10, 1946, and they depict: a Red Deer, a Snowshoe Hare, and a Wood Grouse.